In December 2015 I received a telephone call from Louie the road manager for The Stranglers asking if I could repair the #1 guitar for them. The next day they flew into Aberdeen and dropped off the instrument. After an initial check I found a couple of dry joints in the wiring, but worst of all the bridge pickup, a Seymour Duncan blade pickup, was faulty and giving changing ohms readings. I wondered what to replace it with as there was not enough time to rewind etc. as they had a gig the next day. 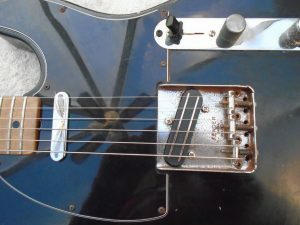 The only pickup I had close to the style was one of my own windings, so fingers crossed I fitted it and sat back and prayed it would be alright. We were invited as guests to the gig that evening and wow, wow, wow the pickup sounded so good. But better still Baz the guitarist looked really happy when he changed the settings etc. The following day I received a telephone call from Louie thanking me for the work and saying that Baz really liked the sound. A couple of days later I then received a phone call from Baz himself thanking me for the work and to complement me on my pickup sound.